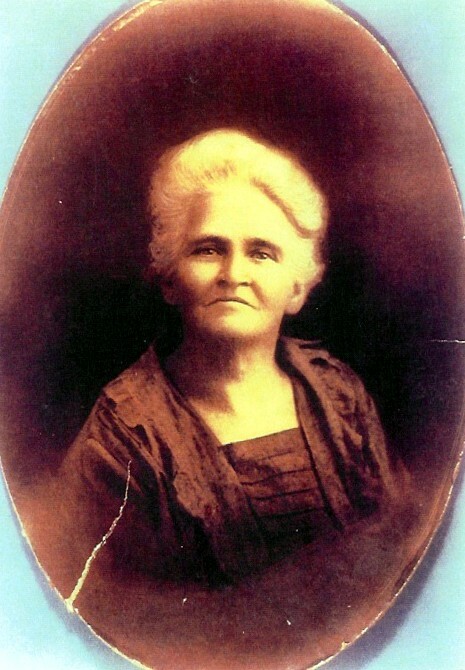 My ancestor, Louise Coleman, used determination and hard work to make the most of life's challenges. Born in 1855 in Rensselaer Co., NY, she married James Dempsey about 1877. They lived for a time in Oswego, NY, near their parents, before moving to Cleveland, Ohio by 1885. All together, seven children are known to have been born to this couple, until their marriage unraveled by the early 1890s. Their married life was marked by regular moves into different lodgings, in the area of Cleveland surrounding the Walker Mfg. Co. Perhaps James was employed there. Their children were baptized at St. Colman's Catholic Church, which served the Irish community. It still operates today. At some point in the early 1900s, Louise and her two youngest children struck out for Chicago, where Louise worked as a "practical nurse" and midwife. She was said to have received an inheritance from someone in New York, which made it possible for her to obtain the training. This was no doubt her brother, Civil War veteran John Henry Coleman, who left her $1300 in his will upon his death in 1891. I believe that Louise wasn't on the best of terms with the remainder of her family in New York, because she expressed a disinterest in ever going back to visit, or in maintaining contact. Perhaps something about the man she chose to marry wasn't acceptable, or perhaps pride kept her from going back. Louise never remarried, and died in California on a visit to her son James in 1923. She is buried in River Grove Cemetery in Cook County, Illinois. Although no marker is visible today, Louise was certainly remembered by her descendants as being a strong and loving woman. Probate proceedings: why aren't they all like this?!? We've all had great hopes of placing our ancestors in an earlier generation by using wills and probate proceedings. Unfortunately, too often some hazy terms are used such as "his wife," or "his children." Sometimes, however, we are surprised by the amount of detail that's been meticulously added. 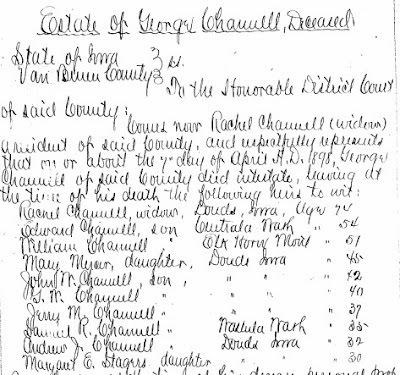 Here is an example from Van Buren County, Iowa, and the estate of my ancestor, George Channell, who died in 1898. Note that every heir is named, along with relationship, residence and age. It isn't as though these are young children, either. This is an excellent means of confirming information I'd collected from other sources. A further example of the benefit of collecting ALL available data, not just listings out of indexes or abstracts. This comes via microfilmed copies available via the Family History Library. I viewed them in Salt Lake City, but the film can be ordered online for viewing at local Family History Centers.